OR never making enough money? I can show you how to turn your business around with a few simple tweaks. Today. Hi, I’m April Lewis, expert at creating business growth strategies for online service providers. In other words, I teach people how to make it rain. Money, that is. to people. I understand how their business works. ignites their ROI in ways they’ve never seen. I was stuck at the $1200/month mark, and had been for about six months. As you can imagine, I didn’t have a lot of money to invest in coaching, business strategy, or programs that would help grow my business forward. But I knew if I didn’t do something and continue to take forward action, no matter how small or how painful, I would not only NOT be able to sustain my business, but it would wither and die. It was time to take a chance. I paid $200 for a beta round of a Genesis web design course. And that small investment, which was 17% of my entire monthly income, was the difference. Within four months my income shot up to $4k/month, and within another three months I hit $8k/month. And then hit another ceiling. Because there is only so much work I can do. There are only 24 hours available to me, you, and everyone else. And I don’t know about you, but I’d like to have a life during some of those 24 hours in a day. I was making $8k/month and still working 6am to midnight. That’s when I learned the lesson I want to share with you today. It’s very important, so pay close attention. with each investment you make in your business. I had to invest way more than $200 in my business to make it through the next growth phase successfully, and onto the next level. I had to invest in a proven strategy or someone who was a strategy consulting expert. I was in the trenches and learning hard lessons, the hard way, which can cost you more time and money than investing in a coach ever could! I guarantee you right now that at some point you will hit a ceiling of growth in your business that will require you to invest back into it in order for it to grow. You need a fresh set of eyes to see what you can’t. Listen, I know it’s a noisy online space out there. It’s hard to know who to trust. I’ve been wading through these waters a few years now. But I was fortunate. I found a couple of great mentors fairly early on and have learned TONS from paying attention and investing in the right services. They’ve helped me get past the $2k/month stagnancy that plagued the first 12 months of my business, and onto $4k/months, $8k/months, $12k/months… and beyond. 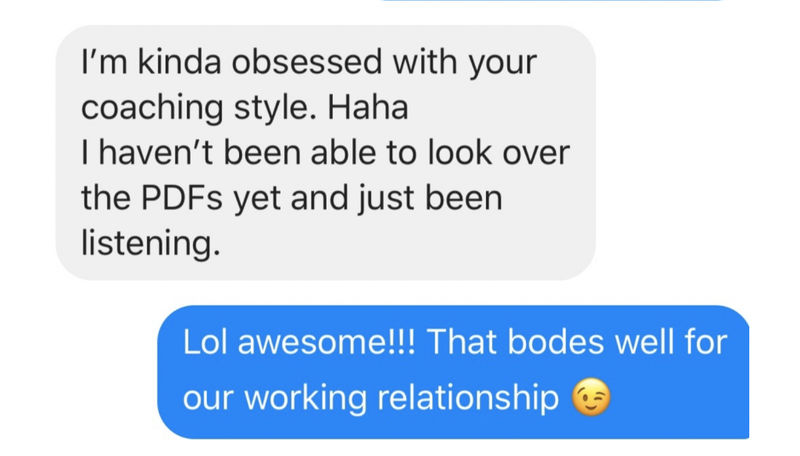 And this is exactly the kind of results I strive to give my 1:1 consulting clients each and every time. 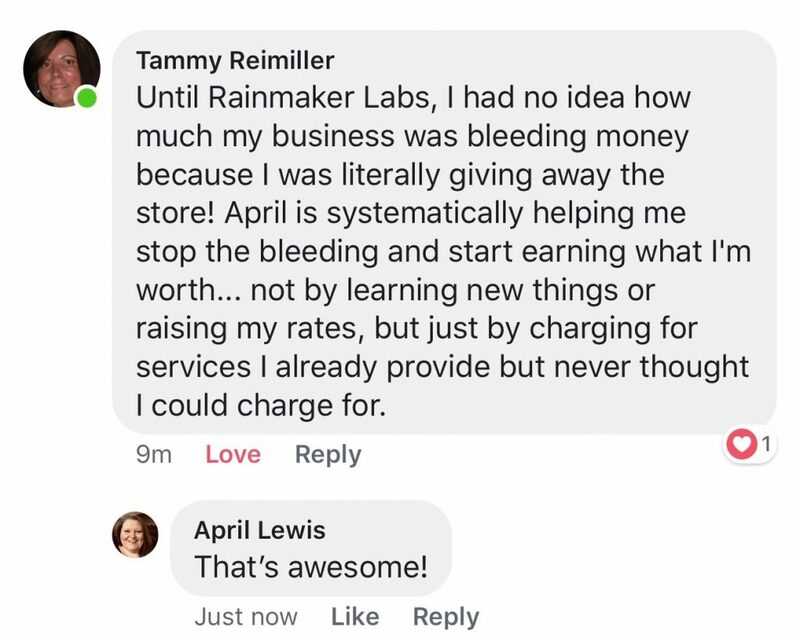 Clients like Tammy that have been in their field of expertise for ten years… who realized how many hours, and therefore dollars, she was throwing away every. single. week. 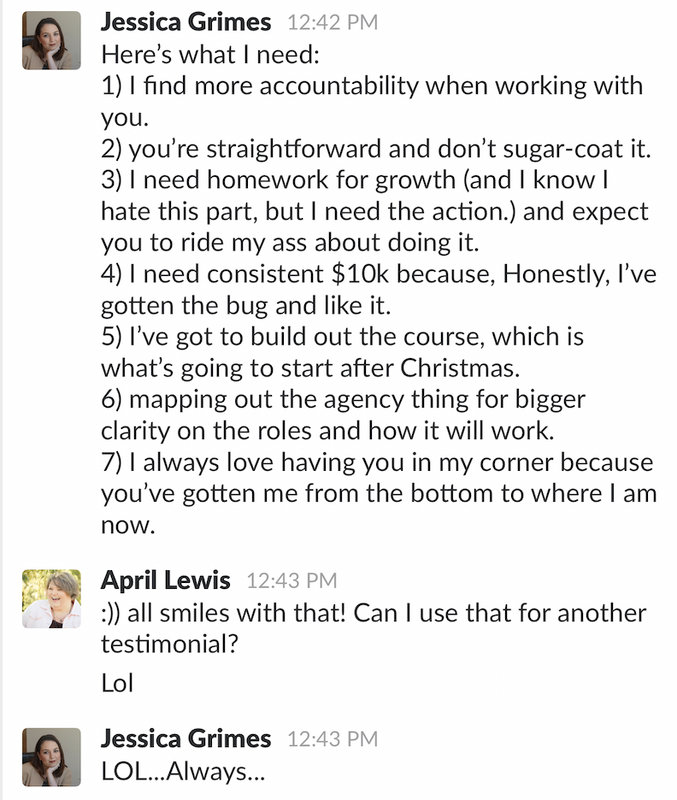 because of one overlooked area in her business… I’m talking thousands of dollars per month, y’all. #AllTheseYears… seriously. Not even saying that for dramatic effect. Or clients like Jessica L. who was already making $10k/month with her business. After some targeted sessions with me, she was able to do what I call ‘creating money’ opportunities in her business. I just wanted to give a shout out of love to April who is an absolute freaking genius. April, you are an amazing woman with an amazing brain and I adore you - 16 sales in 24 hours - woo-hoo! $470 for sending out one email. April helped me map out an ENTIRE affiliate structure which will bring me FIVE new streams of income, layering it all together beautifully, IN ONE HOUR! Her brain is freaking amazing and she is definitely not afraid to get into the nitty-gritty with you! I've spent over $60K on sub-par business education from "gurus". April is different. She's the real deal and gives a lot of value. Absolutely worth the investment! 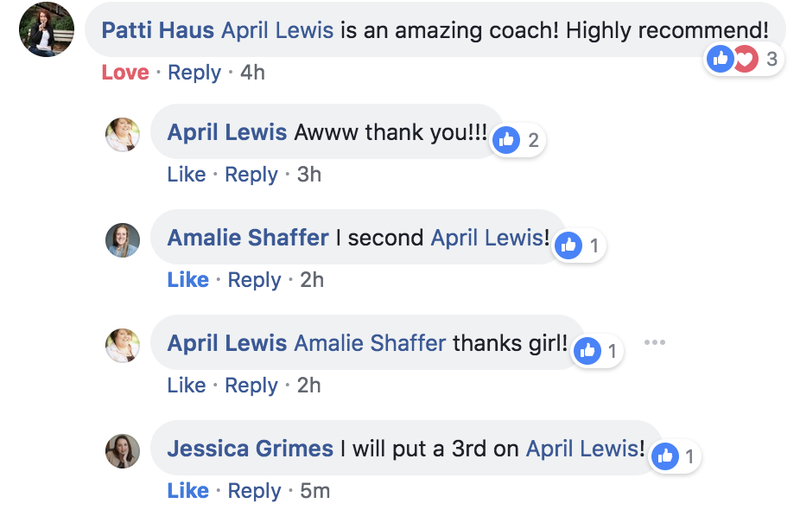 Or my other Jessica client, Jessica G., who was making $1k/month regularly for two years, and by the end of our first year together was able to hit the coveted $10k/month mark. 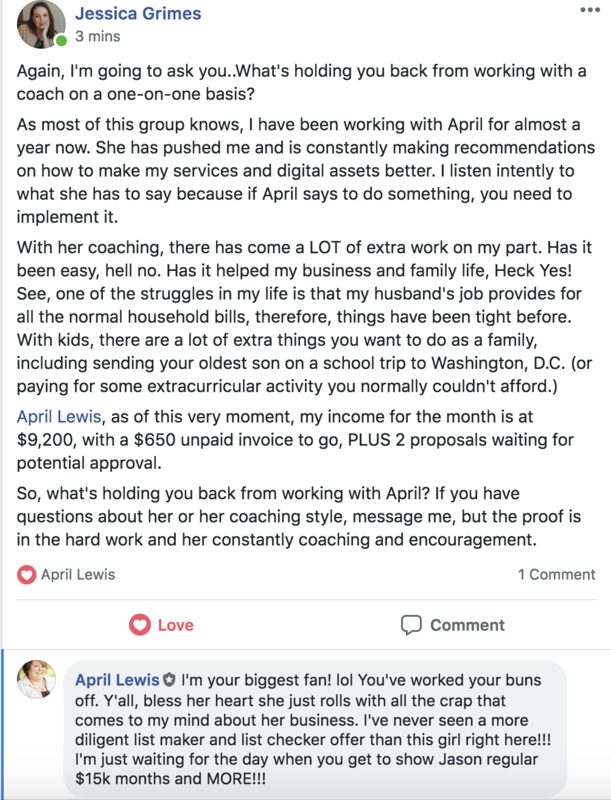 And since this testimonial, she’s declared her new monthly income goal of $20k/month. So tell me, where are you with your business? and your business is going nowhere fast because of indecision? but you’re barely able to book enough projects to stay afloat month after month? NOT hit $3k to $5k a month, or more? I have a track record of success in helping my clients overcome the challenges we face as online service providers with my unique set of skills and experience. I don't want you to struggle anymore. I want you to be able to say goodbye to the 18 hour days that net barely enough income for basic survival needs.  I consult with clients based on my personal experience with successfully growing my own business. Strategies, techniques, and processes that I learned through & failed through the hard way, came out on the other side to conquer, was able to repeat, and then scale effectively. I’ve spent thousands of dollars on the right programs, and hiring the right coaches to further add to my arsenal of tricks, which also meant MORE hours of work in the form of research, strategizing, implementing, monitoring data, tweaking for optimization, and quantifying and qualifying results… for hours and hours on end. My clients have to be action takers. They have to be willing to get down and dirty with me. They are committed and prioritize their business success by putting in sweat equity… or as I like to call it, skin in the game. If you pay for someone to help you turn the tide in your business, with money, time, and sweat equity, you’ll be fully vested in the outcome and subsequent success of your efforts. I’d love the opportunity to chat with you and see exactly how I can make it rain in your business with the knowledge and experience I bring to the table. creating a business and lifestyle you love.